In a nutshell, the Top Home Chef competition is a unique event where 50 volunteer chefs prepare the meal for Gala attendees. Chefs will prepare about 80 - 100 small portions of a dish of their choosing, which will be served at the Gala on April 28th, 2018. Guests will have the opportunity to sample and judge the food along with a panel of celebrity judges. Entries will be categorized by Appetizers, Mains and Desserts and our celebrity judges will be Chef D, Dana Short, Nick Benninger and Chef Scotty. 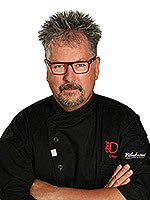 Chef D’s career as a Chef has grown from humble beginnings in Kitchener to all over North America to once more bringing him home to Kitchener. He and his recipes have been featured in Canadian Living and Foodservice and Hospitality magazine's Chef's Corner, various cook books and has been a popular guest on CTV News at Noon Kitchener and Vancouver, City TV’s Breakfast Television, CHCH Morning live, Edmonton CTV Morning Live and Kitchener’s Rogers Daytime. Chef D is filming his Sixth season of his top rated cooking show, ‘At Home with ChefD’ on Rogers TV. He is the author of two cook bookettes, Maple Madness and Garlic Madness. ChefD has prepared meals for the likes of the Late BB King, Stuart Mclean, Blue Rodeo, Michael Buble, Diana Krall and many others. ChefD creates new recipes and flavour profiles for Pillers Meats, Gay Lea, Broil King and Nutra Farms. ChefD believes in sharing his passion for food with others and keeping recipes simple, easy and incredibly tasty!